Back in September we took a look at a game called Nuclear Business by Landfall Games, and it seems Landfall makes games that are born to be GIFs. Here's another in the same vein as Nuclear Business. 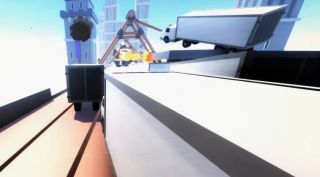 ClusterTruck is an absurd action game in which you have to get from point A to point B by riding the tops of a long convoy of trucks whose drivers, from what I can tell, have never driven a truck. At its best, ClusterTruck makes you feel like Neo from the Matrix, smoothly jumping from one truck to the next. At its worst, it makes you feel the cold embrace of the asphalt—repeatedly and without remorse. The head of Landfall Wilhem Nylund tells me he prefers to make “very mechanics based games,” which is why they work well as GIFs, as “the meat of the game is visible at a glance.” He’s definitely right about that, because I could wax poetic about jumping from truck to truck all I want, but all you really have to do to understand the appeal of ClusterTruck is watch this clip of Nylund playing on one of the latest levels added to the game. It's important to note that he makes this game look easy. I can promise you: it is not that easy. The controls allowed me to be very nimble between jumps, but that also meant they didn’t function how I initially expected they would—especially with the time-slowing ability, where I thought I would have enhanced movement like in GTA 5. Additionally, everything is constantly moving and the textures are mostly solid colors, so I didn’t have many reliable points of reference for just how fast I was going. But once I got more comfortable with it, I started experiencing a few little thrills—though nothing as impressive as above. Honestly, it's hard enough to just survive the driver AI, even without the traps and obstacles. One of the hardest levels I played was simply a long line of trucks on an even longer (completely straight) path. Everything starts out okay, but once one truck falls it all goes to hell. There were occasionally blissful moments in ClusterTruck. Moments where the chaos melted away as I carelessly rode the hood of a moving vehicle past crashes and explosions. I didn't have to jump, never needed to switch trucks, or bother myself with anything quite so stressful as all that. I just let myself be haplessly carried downstream to my destination. That is, of course, before the truck I was on inevitably toppled over at the last possible moment. But these moments were few and far between, and not moving always felt like the riskier strategy. Running fast and maintaining momentum let me respond to unexpected crashes quickly, where as standing still left me like a sitting duck—if that duck were on top of a moving car. I could take my chances and stay at the back of the pack the whole level, but that usually just meant there was more chaos happening in front of me. The elegant cruelty of many of the traps and obstacles kept me interested and eager to reach the next set of levels. The final game will have 100 levels broken into 10 sets, each with their own theme and special hurdles to overcome. The GIF above shows off a crystal themed world with deadly lasers scattered about. Lasers are a simple but incredibly effective way to put you out of your comfort zone, forcing you to move when you otherwise wouldn’t need to. Lasers are also a simple, but very effective, way to murder you. The level complexity escalates when those lasers start moving, trucks start swerving, and so on and so forth until Nylund has created a level even he can’t beat. I only got to play the current alpha version, and it's definitely still early days for ClusterTruck, but I'm excited to see where Landfall Games takes it. More exciting than the levels Landfall still has to make is that a level editor and Steam workshop support will be coming with the game’s launch. Releasing with a strong set of levels and then letting the community run wild past that could take ClusterTruck from being an amusing distraction to a cult classic. Landfall Games expects ClusterTruck to cost around $10 and come out officially sometime around April—though Nylund told me that they “initially intended for the game to be a small project with a short development,” but have extended development since then, and are considering pushing that date back even further since the game has been “gaining more and more traction.” You can find regular updates about the game (and lots more impressive GIFs) on the ClusterTruck subreddit.